Eiheiji temple is one of the head temple of the Soto school of Buddhism in Japan. Its history dates back to the 13th century. Manners of the training has continued since when they were founded. There are about 200 ascetic monks. In a quiet atmosphere, Garan which is the training place is beautiful and the culture of sophisticated monks will dazzle your eyes. This place will introduce details of Eiheiji, the temple town and events for travelers who are going to visit Eiheiji. Also if you want to know the best 5 places to visit in Fukui including this place, please also see Fukui Sightseeing Place Guide. Eiheiji temple is a head temple of the Soto school of Buddhism. It’s history began in 1244 when Dogen Zenji founded it. Dogen brought back the latest knowledge from China and he concentrated on educating future leaders of the Soto school by building for training centers called “Garan” and making rules for training. Eiheiji was authorized by the Emperor Goenyu as “First Soto Dojo in Japan”. Also the Edo Shogunate made a law called “Eiheiji Shohatto” in 1615 and it says Eiheiji is the head temple of Soto school and will governance all the Soto school temples in Japan. It continues to be a authorized temple for a long time though the government has changed. It is not an exaggeration to say Eiheiji is The Temple of all temples. It was taken in on war and fire for many times during the long history. Though it kept respect from the people and recovered and protected it’s history. It’s history can be explained by monks following rules made by Dogen and the silent atmosphere of Garan buildings surrounded by tall cedar trees. Going to introduce the things you cannot miss at Eiheiji. A stately Garan of Eiheiji which is suited for training, monks and Eiheiji town which protects it’s faith and tradition. 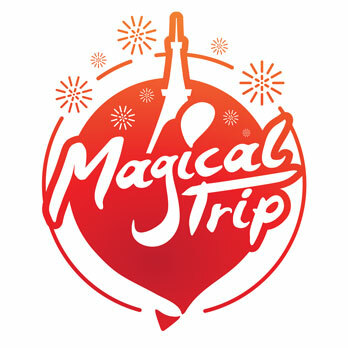 Eiheiji was given two-stars on the French tourist guide book”Michelin Green Guide Japon”. This mean even Oversea people think that it has reputation and beautiful and worth feeling it’s history. So, what kind of thing of this temple fascinates the people? 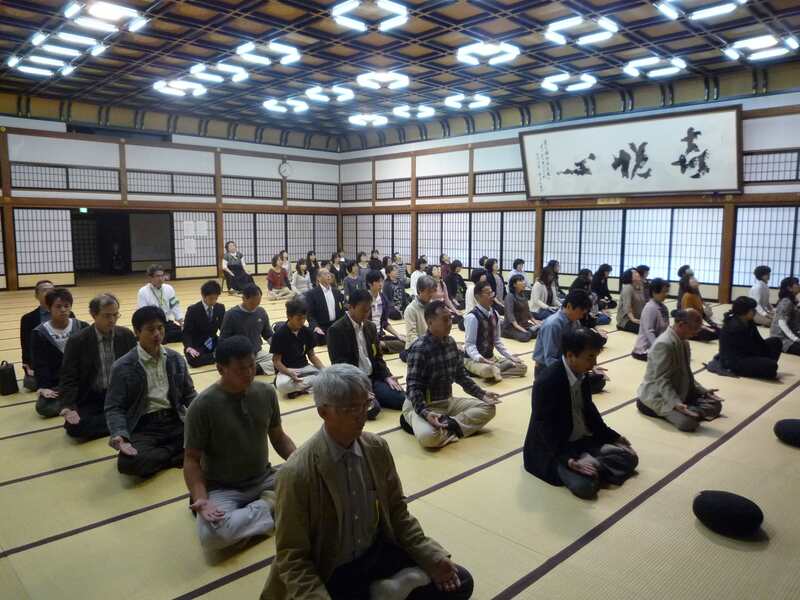 Even now nearly 200 trainee monks are continuing rigorous training at Eiheiji. Their manner of training has been continued since it was founded 750 years ago. Training at this temple is said to be the most severe training in ZEN Buddhism which has ZEN meditation training. At Eiheiji, from waking up to going to bed, every single thing is training. Even face-wash, ZEN meditation, having meal and going to the bathroom. There is a rule and manner for everything. For example, ZEN meditation, praying, bowing, how to have meal, walking the hallway and etc. There is a method for everything. Even if you do not know the manner, it is possible to feel that the manner is refined by watching the behavior of monks Taking a photo of monks are prohibited. You need to see their behavior directly with your own eyes. The training center is called “Shichido Garan” and there are 7 buildings. the 7 buildings are “Sanmon”, “Butsuden”, “Hatto”, “Sodo”, “Daikuin”, “Yokushitsu” and “Tosu”.Including these “Shichido Garan”, Eiheiji has lots of historical buildings are quietly standing. As mentioned before, Eiheiji’s buildings has been burned down many times.Each time, they have recovered by rebuilding the buildings. So, the oldest building is only about 300 years old though their history is longer than 700 years.However, how the Garans are arrange d is said to have the same atmosphere of the past. Galans and monks embodies the history of this temple even now.The arrangement of this temple is likened to body of human. Each place has a special meaning. Following are introduction of Eiheiji’s building. Mainly about “Shichido Garan”. One of the Shichido Garan, Sanmon is the entrance f Eiheiji. If Shichido Garan is a human body, the Sanmon is located around the waist. This temple’s existing oldest building is this Sanmon. It is said that it was renovated more than 250 years ago, in1749. And honor the solemn atmosphere as the entrance to the place of training. Around February every year, Eiheiji accepts new monks. When a monk is entering, they genuflection at this Sanmon and they need to wait hours for a monk called Kaan who is in charge for taking care of visiors to come. This is a test to check if the new monk has patience to wait though it is the most coldest time in winter. Training at this temple is really tough so they are giving this kind of challenge in front of Sanmon before the monk enters. The main gate has a pair of document on left and right. Following are the things written. (Training at Eiheiji is tough. No matter even you have social status, if you do not have a true mind to have training, You are not accepted to enter Sanmon. 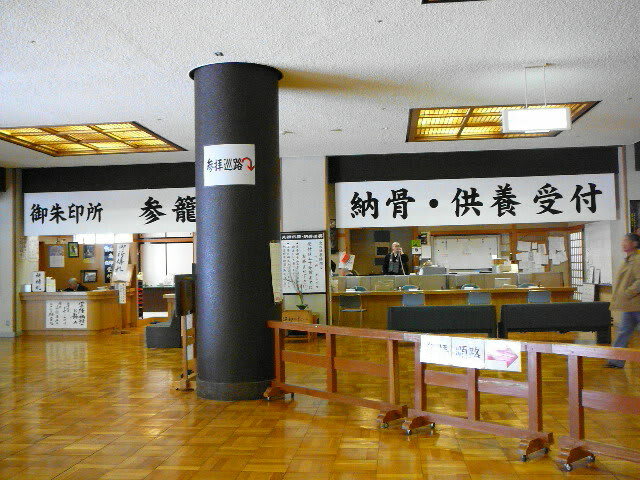 Eiheiji’s Sanmon has been the first checking station for monk candidates. At Sanmon, you will feel the history that a lot of monk candidates were keep on visiting this temple to have training. At Butsuden of Eiheiji, the statues of 3 generation Buddha, Buddha, Maitreya and Amitabha (representing the current, future and past) are enshrined, which are the most important in the religion. Buddha in the center, to the right Maitreya, there is Amida to the left. Butsuden has been renovated in 1902 as a 650 years after death of Dogen anniversary project. The appearance in the manner of a Song Dynasty and has double roof. The building is totally made of cypress. The floor is stone pavement. It is the most beautiful building of all Shichido Garan. There is also a meaning for the position of Butsuden. If Eiheiji is a human body, Butsuden is located where the heart is. Butsuden is the heart of this temple. 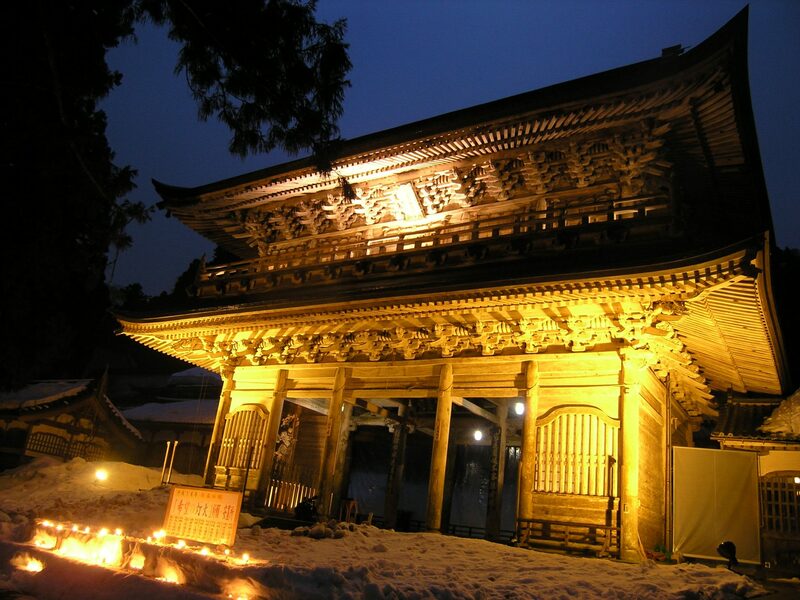 Eiheiji’s Hatto is the place where the monk is chanting the sutra or having Buddhist memorial service/Avalokiteśvara has been enshrined and plays the role of the main hall with Butsuden. Built in 1843, it has passed more than 150 years since it was built. It is on the peak of Eiheiji, where you can see the beautiful views of the mountains. If this temple is a human body, Hatto is located where the head is. On both sides of the front of the space where the Buddha is enshrined (called Naijin), a pair of the white lion of A-Un are placed. A is the fist sound you make when you open the mouth, Un is the last sound you make after you close your mouth. So this represents the beginning and end of the universe and also represents everything of Buddhism. In addition a pair also means that it is a special place of the religion. Daikuin is where monks make their meal. Yes, it is the kitchen. Has been renovated in 1930, it has become a splendid building three floors with a basement. It still has the elevator that has been implemented when it was built. It is the oldest operating elevator in Japan. If Shichido Garan is a human body, the Daikuin is located on the left hand. Meal is made by monks who has a role called Tenzo. Dogen has a strong thought that meal is training. He left a manual called “Tenzo Kyokun” which tells the detailed duties need to be performed by Tenzo. For example, there is a Buddist ceremony called “Sojiki Kyuhai” Monk needs to place the meal on a Handai table, put on Kasaya cloth and sit on a Zagu mat, burn incense and bow 9 times. Meals can be carried after this worship is over. By such actions, monks will feel that taking a meal, being able to live and have training is preciousness. 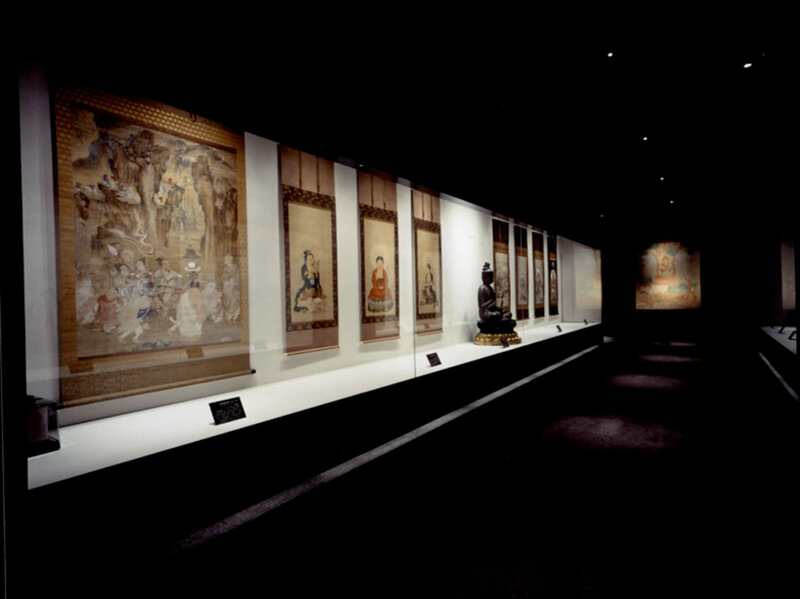 These Buddist ceremonies are not shown to the public so travelers cannot see. But if know that Daikuin is regarded as a place of important training, it would change perspective. Sodo is also referred to as “Undo” or “Zazendo”. It is a place where monks have ZEN meditation, meal, sleep training. It is the one of the Sanmoku Dojo and talking is strictly prohibited here. The capacity of monks are, 82 for sleeping, 164 for ZEN meditation. However, as there is a word “Half tatami for staying awake, One tatami for sleeping”, space allocated to each monk is small and training will be done there. Sodo is a building that has been renovated in 1902 as well as Butsuden. Also made on the format of the Chinese Song Dynasty. If Shichido Garan is a human body, the Sodo is located on the right hand. Eiheiji’s Yokushitsu is the bath of the monks. Like Sodo, Yokushitsu is also one of the Sanmoku Dojo. It is prohibited to talk here. Having a bath is also a important training to clean the body and mind. They also have a certain manner too. The day with the number 4 & 9 are the day to take a bath. During summer, they are alowed to wash the body. Eiheiji’s Yokushitsu is a quite new building renovated in 1980. If Shichido Garan is a human body, the Yokushitsu is located on the left foot. Tosu is the bathroom of monks. This is also one of the Sanmoku Dojo. It is prohibited to talk here. Like Yokushitsu, Tosu is also a place to clean mind and body. If Shichido Garan is a human body, the Tosu is located on the right foot. Going to introduce Garan that are not included in the Shichido Garan from now on. Going through the private gate of Eiheiji, you will be visiting Kichijokaku and Sanshokaku. Kichijokaku is a building with 5 floors and basement. Visitors can have ZEN meditation experiences and Sutras experience here. Paying 500 yen as a admission fee at the private gate and go in to Kichijokaku. There is a guide map and some announcement about the manner during the worship. – Do not touch the bells and drums and etc. The building next to Kichijokaku is Sanshokaku. Training for visitors are held here. You must see the large roon in 2nd floor. 230 paintings such as flowers and birds have been fitted to the ceiling. The ceiling painting are restored ceiling paintings of 1930. They are by 144 famous painters. A room with more than 100 sheets of tatami and 230 paintings is fabulous. This is a place you can not miss when you visit Eiheiji. Eiheiji’s Ruri Shobokaku is a history museum that exhibit treasures of this temple. In their storage, they have 800 tresures including national tresure “Fukanzasengi” and importante cultural assets, and able to see some of them. The goods surrounding Dogen and history of this temple has been permanent exhibition, also exhibitions they have special exhibitions too. It is possible to feel the history of this temple from paintings, ancient documents and Buddha statues. It was renovated in 2002 as an 750 years after death of Dogen project. Unfortunately, taking photos are not accepted. If you pay the admissions fee, you can enter Ruri Shobokaku to. How about walking in there when you visit EiheijiLocation is right next to this temple, located at the end of the visitor route. 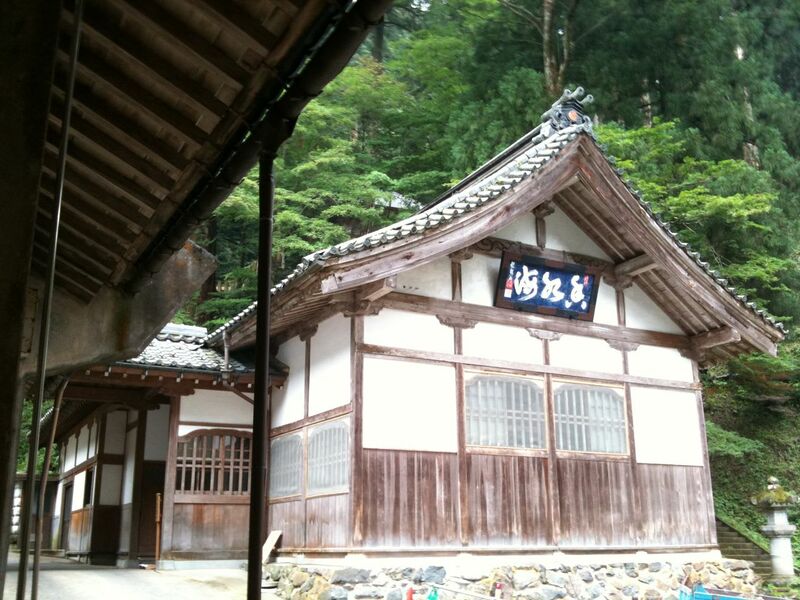 At Eiheiji, they provide an Eiheiji temple stay program called “Sanro” experience. This is a two days one night program at this temple. During this program, part of the training will be provided as a experience. You will be able to learn about ZEN, which Steve Jobs was immersed in. However, the training is an experience, it is a really tough program. For example, everybody needs to wakeup at 3 am and have 40 minutes Zazen training for 40 minutes. Some people are sleepy and get leg pain. You might feel it is a torture. If you are not a native Japanese and want to join this program, you will need to be able to understand Japanese well. Because you will need to understand the schedule and notes instructed by the monk. To join the Sanro experience, making a reservation in advance via phone is required. You need to confirm when the program is held and make a reservation more thant 2 weeks before the experience. Phone number is +81-776-63-3102. Then an application form will be sent from Eiheiji. Fill up the required information and send it back. Reservation is complete when you receive a confirmation letter from this temple. On the day, go to Eiheiji before the specified time. Pay 8,000 yen as program fee. Also, there is a much more tougher 4 days 3nights “Sanzen” experience. This program is much more severe training than Sanro experience. Some people faint away or cancel without accomplishing the program. This program is not recommended for normal tourists. To join the Sanzen experience, making a reservationk advance via phone is required. When you make a call, they will require to answer some questions via roundtrip postcard and send it to Eiheiji. When the postcard reaches this temple, they will call you and confirm your final participation intention. Reservation is complete when you receive a post card from Eiheiji. Sanzen experience program fee is 13,600 yen. Admission fees of Eiheiji are, 500 yen per adult. 200 yen per elementary and intermediate school students. As mentioned above, you can also enter the Ruri Shobokaku treasure house if you pay the admissions fee. Following are the open hours of Eiheiji. They do not have a closed day. To go to Eiheiji, take the Echizen Railway’s Katsuyama Eiheiji line and get of at Eiheijiguchi Station. Take the Keifuku Bus’s Eiheiji line bound to Eiheiji or taxi. You will arrive in 15 minutes. Or from Fukui Station East Exit, take the Keifuku Bus’s Eiheiji liner bound to Eiheiji. You will arrive in 30minutes. What kind of impressions did the visitors of Eiheiji have. Following are some reviews that might be helpful if you are planning to visit Eiheiji in the future. I came to Eiheiji again. Last time was four years ago. It is a huge place and I feel my heart is washed while visiting each Shichido Garan. Since I had a lot of time. I was able to visit each of them twice. Autumn leaves are also beautiful. I was able to enjoy watching Garan and Nishiki and fully enjoyed the autumn of Japan. I also received a Goshuin stamp and became a solemn feeling. When I visit this temple, I reach a deep emotion which is different from the other temples. Eiheiji has a good access. They also have a direct bus from Fukui StationAlso at this temple, all buildings are connected with a indoor path so you do not have to care about the weather. I was planning to spend 2 hours for sightseeing. Actually I was walking the route slowly but it only took about 1 hour. I used the remaining time for going to the shops around the temple. Because I went on the season of snow , I was only able to walk inside the Garan. Inside the Garan was huge and most of the part was connected with path or stairs so I walked slowly. I was sightseeing for about 1 hour. Since the usual worship route was displayed, it was easy to understand. During the sightseeing I met some monks and priest for several times. It was 8 am of a weekday so I did not meet a tourist inside. When I left the Garan, I saw about 10 tourists. The Garan is huge but the building itself is in harmony as a part of nature. It is so beautiful. My main purpose of the trip was “visiting100 famous castles” but this became the best memory during the trip. When I visit next time, I would like to have Sutras experience and would like to get a chance to hear a story from a monk if it is possible. Inside the garan, it is like walking a mountain so it might be a little tough for people not good at climbing mountains. Went there in the winter on our way back from Kanazawa by car. With the snow, the temple is more pictureseque. If you pay the admission fee, they allow you to walk around inside the temple, so you can observe the priests in training but will NOT allow you to take photographs of them. It is so fascinating and interesting to see the monks, going about their daily routine !! Due to their religious beliefs, they are strict vegetarians. If you want to give it a try at their vegetarian dishes, I would recommend you to try “Eiheiji Soba” (buckwheat noodles) in any of the the nearby restaurants while you are there as well. In front of Eiheiji, Eiheiji’s temple town is located. Souvenir shops and restaurants are there. Famous thins are Goriyaku Dango, soba made in Fukui Prefecture and traditional crafts made in Fukui. 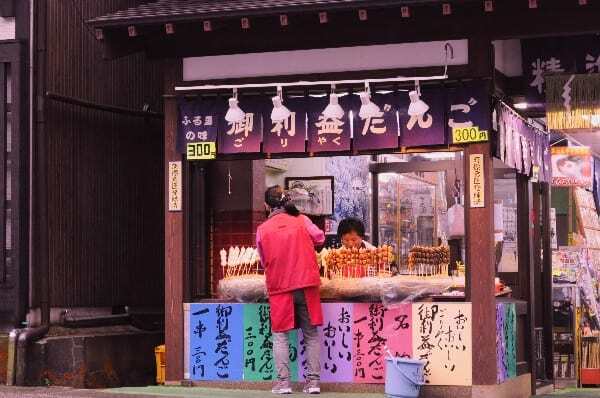 For example, 2 minute walk from Eiheiji, you will be able to have Goriyaku Dango at souvenir shop “Sanko”. When you order, they will cut off the stick and pass it you. It has a meaning of cutting the suffering and death. It is a popular item as a lucky charm. In addition, it is possible to have, soba with sesame tofu at the store. They also sell calligraphs as a souvenir. Also a 2 minute from Eiheiji, you can have handmade soba at “Azekawa”. They only use soba flour from Fukui Prefecture. the dip soup is a special soup which has 80 years of history. The store is built by temple builders. There are lots of restaurant and souvenir shop around here. Try them when you visit Eiheiji. From here, introducing seasonal events related to Eiheiji, which travelers can enjoy. Beginning in May, on the last day of the Golden Week holidays, Eiheiji Hana Mtsuri Flower is held. 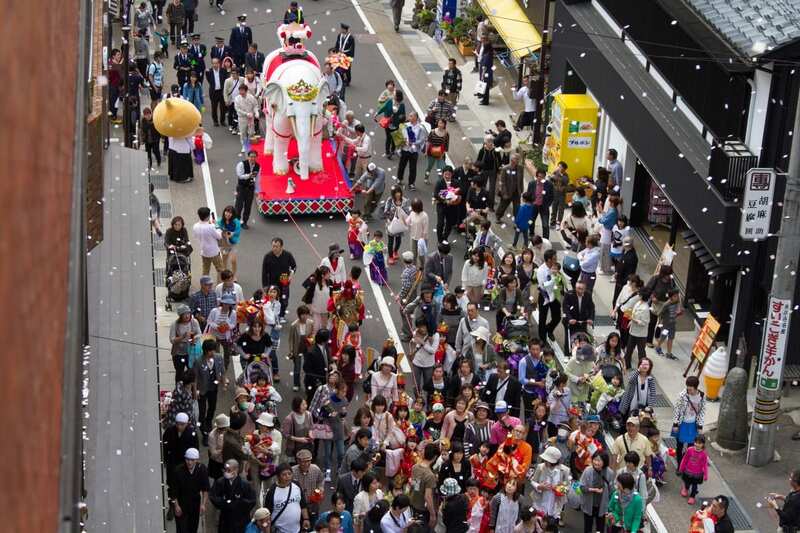 From Eiheiji’s temple town, parade of a long line of children and a parade of pulling the model of white elephant will start. The parade’s goal is Eiheiji. there are special events at the temple too. You will be able to feel a special atmosphere at the temple. On Sunday of middle of August, At Eiheiji Kasen Park of Kuzuryu River, Eiheiji Dai Toro Nagashi is held. Toro Nagashi is a event to mourn the death of people. Lantern with candles will be going gently down the stream. During Eiheiji Dai Toro Nagashi about 10 thousand units of lantern will be going gently down the stream while monks of Eiheiji read the sutras. The band of light over the river is beautiful and it has been certified as a Japan night view heritage. At the end of the event, about 1000 fireworks are used. The date of the event can be confirmed on their special site or Eiheiji town’s special website. Held location is not Eiheiji so you need to be careful. The Eiheiji Kasen Park is along the Kuzuryu River. On the event day, shuttle bus is operated from Eiheijiguchi Station. In the night time of New Year’s Eve every year, Eiheiji and it’s Garan’s are lit up. You can see a special fantastic scenery. There are other events too. You can have an experience to ring the Joya no Kane. Also, Karamon which you cannot enter usually will be open. A lot of worshipers visit here in the new year. You will feel a fresh atmosphere that greets the New Year. If you experience the New Year countdown at Eiheiji, you will be able to greet a pleasant New Year. If you are interested in joining a tour visiting Eiheiji Temple, please visit “Top 5 Scenic Tours in Fukui: Recommended by Locals“.